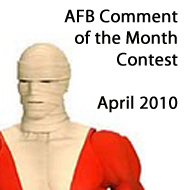 The AFB Comment of the Month Contest - April 2010! First off, thanks to everyone who commented on last month’s blog posts. Congratulations to AFB Forum Member Westy and AFB Facebook Fan Renny Roccon for being our winners in this two prize month! Winners - please get in touch with me – probably easiest to do so through the AFB Forum – just log in and message me (“Andy”). Once we hear from these gents their choices of either the DC Direct Blackest Night Larfleeze or the Marvel Select Thing will be on the way when available from Mike’s Comics N’ Stuff. 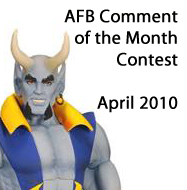 Now to April’s Contest: on offer are two great prizes, either the Negative Man (regular) or Blue Devil figure from DC Universe Classics Wave 13!. I won?! Aww cool! Thanks Andy! I'm going for the ever lovin' blue eyed thing, and will either replace the two pack Ben Grimm in my ML display, or put him straight in the Nerd Room. Congrats, the Forum masters here are a cool couple of guys to keep doing this contest. Both Larfleeze and Thing are great looking pieces. Good luck to the future entrants as well. Hey there! this is Renny! man i had no idea i won! i just did a search for something else and my name came up! I will message you through facebook if thats ok! Congratulations! What an exciting month March was, will April be the same? I love the negative man figure, or should I say men! I only hope that DC will complete my doom patrol set of figures and make me a RITA!!!! well congrats to all winners!